You ever see a situation that’s less than ideal unfolding from afar and then think to yourself, in a really resigned kind of way, “Alright. Fine. Let’s do this thing”? 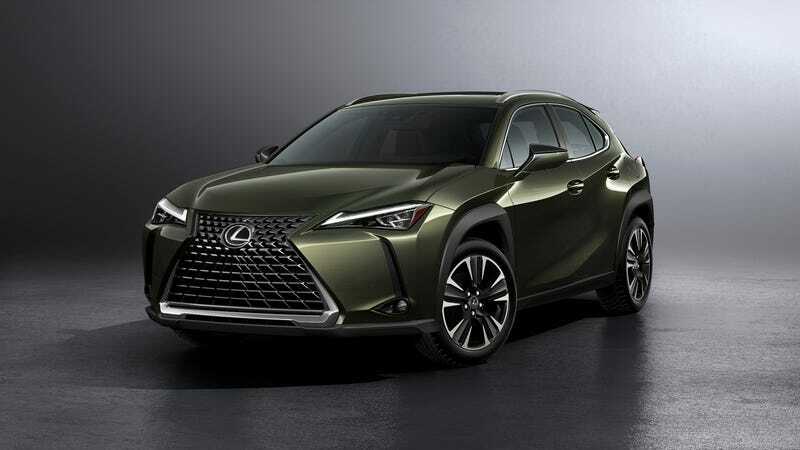 That basically sums up my feelings for the 2019 Lexus UX compact crossover. I’m turned off by the massive spindle grille on the UX, and because people can’t seem to get enough of the compact crossovers, I know that these things will soon make new empires for themselves across suburban America. The UX shares the same Global Architecture – Compact (GA-C) platform that the Toyota C-HR does. It will be offered with two choices of engine: the UX 200, with a 2.0-liter engine, good for 168 horsepower and paired with a CVT and the UX 250H, with a hybrid system with a projected output of 176 total system horsepower and all-wheel drive. The press release touts the UX’s ability to fit into compact parking spaces and how it has a tight turning radius. The inside at least looks semi driver-oriented...! If all of that sounds slightly too vanilla for you, Lexus is offering a UX F Sport option. It includes suspension tuning, a new rear bumper design, 18-inch wheels and black trim. Inside, you can haveLexus LFA-inspired seats and an F Sport steering wheel with aluminum pedals and footrest. Production will start this fall with sales happening in December. Pricing will be announced then. I can barely contain my excitement.